So for I like the look of this option... with what appears to be some stipling along the sides. That looks similar to the Strike Industries forend design. I could be wrong, but I see set screws similar to the Strike Industries Benelli M4 handguard. I really don't like that design because it really gouges the weapon everywhere the screws contact for a snug fit. 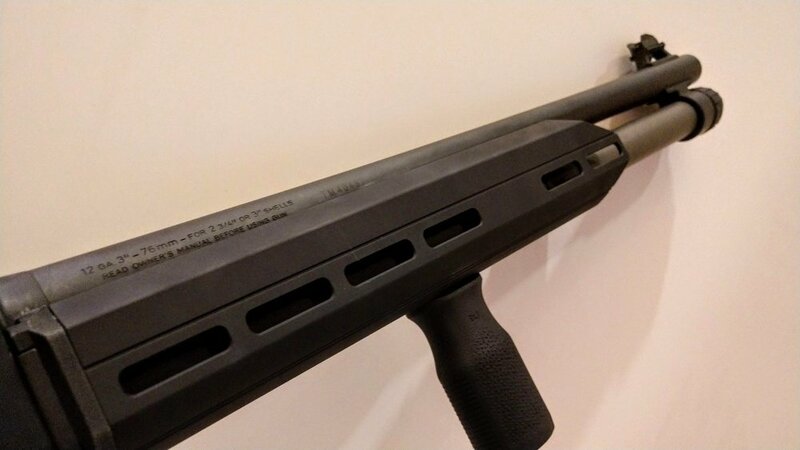 I'd dig it more if they used nylon tipped set screws or anything other than something that messes up such a fine shotgun. The Mesa Tactical Truckee handguard looks like the best design so far to me. No set screws, it's longer than the original handguard and Mlok all over. I haven't see a video showing how it is installed yet though. Ah, missed that. I wish the m-lok slots were higher up on the truckee forend. This Briley unit looks promising. I don’t think those are set screws. They’re too far forward on the rear set. They’re likely a mounting for whatever they designed to interface with the existing handguard retainers. I believe you are correct. Even the front screws are too far back to contact any part of the weapon.